Imagine ordering a cab and being picked up by this. We’ve seen supercars serving as police cars, but what about taxi cabs? Typically, if you hail a taxi you’ll be picked up in an unassuming sedan like a Crown Victoria. 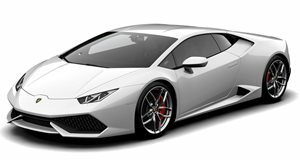 But if you happen to live in Lincoln over in the UK, you can now hire a Lamborghini Huracan taxi cab to drive you to your destination in style. According to The Sun, the supercar has been officially licensed for taxi duty by the City of Lincoln Council for use by the Handsome Cabs taxi company. The super cab can also be hired for special events such as weddings, prom nights or business trips. “It is certainly an impressive vehicle and one which will no doubt turn many heads around the streets of Lincoln and beyond,” Councillor Cath Brothwell, chairman of the council’s licensing committee, said. “People will be used to seeing cars like this in The Fast and Furious, but not so much on Firth Road and Flaxengate.” The supercar taxi service will launch in six weeks. With its 602-hp V10 naturally aspirated engine, 0-60 mph time of 3.4 seconds and 200 mph top speed, it’s probably safe to declare the Lamborghini Huracan as the world’s fastest taxi.